Adding to this thread, we received our approval from the TTB last week, January 18, 2018. The initial application was submitted on November 29th, 2017. So, 51 days with some holidays in there. There were a couple minor questions that were quickly answered. We did use a professional consultant, John Springer, and the process was seamless and he did a great job. 70 days. Just got our DSP last week!!!!!!!!!!!!! Now we get to go deal with the state of Virginia. DSP approved in just 54 days ! We couldn't be happier with the process. Adding a brewery permit to that so we can do a small amount of beer for the tasting room only took another 30 days. We are fully permitted on the federal side. We assumed it would take longer so we started that process before construction even began. Now we have a DSP and are still building. I can't say enough good things about the consultant we hired to do this for us. This process with Jerry was completely painless. We also thought it would take longer than it did and are still trying to get contractors in to finish the inside of our building. We used the Rob Pinson and the team at Waller Law for our app, and everything went smoothly. Took us 45 days and $$$$ in help from our alcoholic beverage market attorney. But building permits took 200 days and $$$$$ in architecture and engineering costs. I had it backwards in my plans. 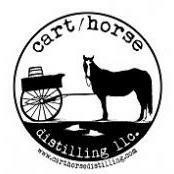 21 Days for us at Rhode Island Spirits (Pawtucket). Knock me over with feather. We did it ourselves, too. Submitted 7/10/18 received 10/15/18 (97 days). Filled ourselves, minor corrections required for description of premises. 107 days, including the shutdown. 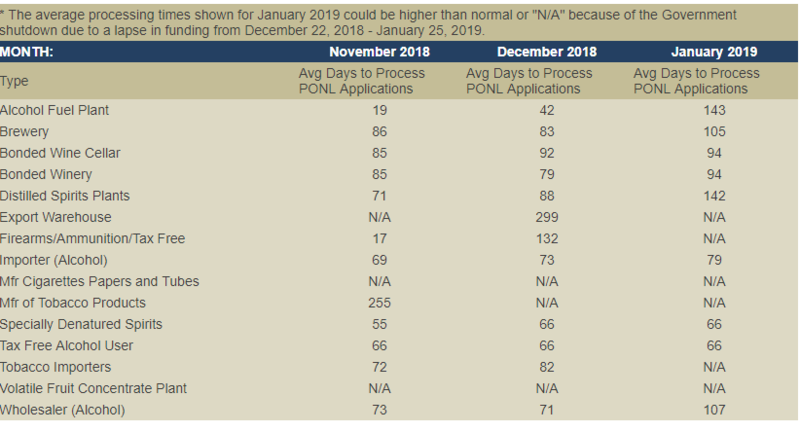 Priority Goal: Reduce average approval times for alcohol and tobacco business permits by at least 20 percent (from 96 days to 75 days) and achieve the 75-day standard for 85 percent of applicants by September 30, 2019. That is the goal. It is across all permits and registrations and average times vary by the type of application. Here, for example, are the times for January 2019, the last month for which TTB has posted average figures. Now, for every "oh my god I'm happy" that you find here, you must end up with a balancing "oh crap, this is taking a long time." I can tell you from experience, the long and the short of it is that any application can end up on the long or the short tend. Well prepared applications put in a position to get lucky, but you must get lucky first. Not everyone does.